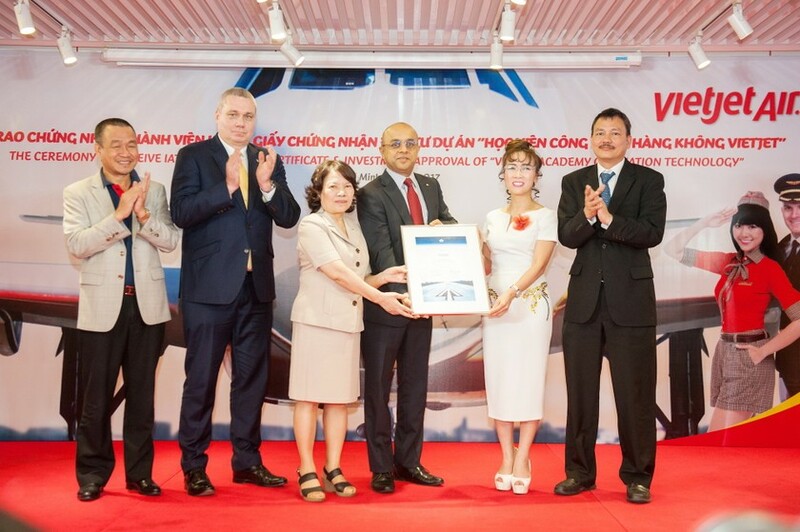 Vietjet received full membership from the International Air Transportation Association (IATA) yesterday, affirming the new-age carrier’s role and position in the aviation community in Vietnam and the world. IATA, the most professional, consistent and comprehensive voice of the international aviation industry, actively seeks to support and increase the benefits for all airline members through international recognition, orientation for the industry priorities, encouragement for promotion and innovation in the industry, cost management and cooperation campaigns for communication, training and other services. Also Vietjet recently announced the airline had continued to post positive growth through 2016 with a revenue of VND27,532 billion (USD1.21 billion) and a profit of VND2,394 billion (USD105 million). With its commitment to tapping increasing demand for air-travel, the airline also achieved a load factor of 88.9percent with more than 14 million passengers carried last year, greatly contributing to the development of Vietnam’s aviation industry and economic growth in Vietnam in the process. Vietjet’s operational side also registered a high performance in terms of safety and reliability compared to other airlines in the Asia-Pacific region. It operated a total of 84,535 flights accounting for 121,213 flight hours in 2016. The airline’s technical reliability stood at 99.56percent, the highest rate obtained to date by any airline operating A320/A321 in the region. On-time performance for the year stood at 83.6percent. Vietjet today also cheerfully received investment approval from the People’s Committee of Ho Chi Minh City - Board of Management of Saigon Hi-tech Park for its Aviation Technology Center project as part of a program to develop the Vietjet Aviation Academy in Saigon Hi-Tech Park. The project will break ground in March 2017 and go into operation this December – the first phase will be a Full Flight Simulator Center for pilot training, run in cooperation with aircraft manufacturer Airbus.